Over time, some OR procedures have become more prevalent, while others have decreased in frequency. For instance, prior research has found that the volume of coronary artery bypass graft (CABG) decreased by 70 percent from 1997 to 2007, while the volume of percutaneous transluminal coronary angioplasty (PTCA) increased by 20 percent during this same time period.3 Such trends may reflect changing standards in surgical care, the introduction of new surgical techniques, a shift in procedure setting from inpatient to outpatient, or an aging population, among other reasons. This Statistical Brief presents data from the Healthcare Cost and Utilization Project (HCUP) on trends in OR procedures from 2001 through 2011. For this Statistical Brief, OR procedures are defined using the HCUP procedure classes tool.4 In this tool, OR procedures are identified based on diagnosis-related groups (DRGs) that use physician panels to determine whether the procedure would be performed in a hospital OR in most hospitals. The findings in this Statistical Brief represent an update of 2007 statistics reported by Elixhauser and Andrews.5 We present the 2001 and 2011 volume of OR procedures by major clinical body system. For selected high-volume procedures, we provide the trends and identify differences over the 11-year period examined. All differences between estimates noted in the text are significantly different at the .001 level or better. Table 1 presents the number of OR procedures by major clinical body system in 2001 and 2011. Although the overall number of procedures remained relatively unchanged across this time frame, the mix of procedures changed substantially. In 2011, over 15 million operating room (OR) procedures were performed in U.S. hospitals. Although the overall number of procedures remained stable from 2001—2011, the mix of procedures changed. In 2001, musculoskeletal procedures constituted 17.9 percent of all procedures. By 2011, this figure rose to 24.2 percent, which is a 38 percent increase in 11 years. Within the musculoskeletal system, knee arthroplasty had the largest growth in volume, nearly doubling between 2001 and 2011 (a 93 percent increase). Approximately 718,500 knee arthroplasties were performed in 2011. 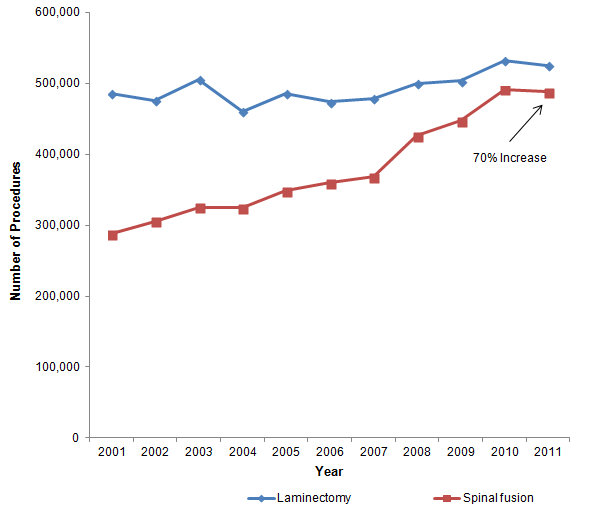 There was a 70 percent growth in spinal fusion during the 11-year period. 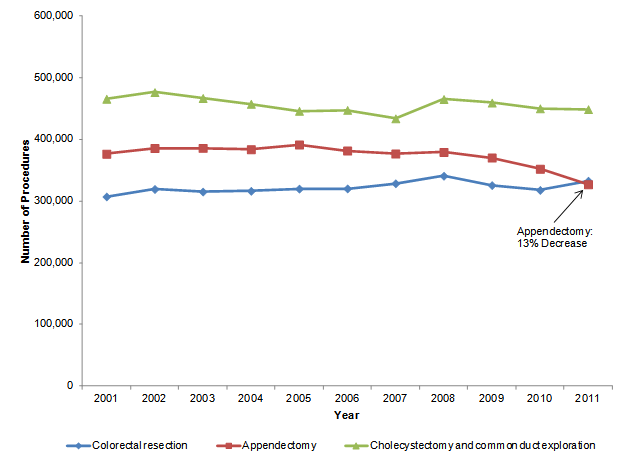 Among digestive-related procedures, appendectomies decreased by 13 percent, while colorectal resection and cholecystectomy procedures remained relatively stable over time. Two common cardiovascular procedures decreased from 2001—2011. Coronary artery bypass graft (CABG) procedures decreased by nearly half to 213,700 procedures in 2011, and percutaneous coronary angioplasty (PTCA) decreased by more than one-fourth to 560,500 procedures in 2011. Note: The difference in volume between 2001 and 2011 was statistically significant for each clinical body system at p<.0001. In 2011, nearly one-fourth (24.2 percent) of the 15,661,700 total OR procedures involved the musculoskeletal system, which is a 38 percent increase from 17.9 percent in 2001. There was a small increase (5 percent) in OR procedures of the digestive system between 2001 and 2011—from 18.0 percent to 18.5 percent of all OR procedures. OR procedures involving the cardiovascular system decreased from 15.5 percent of all OR procedures in 2001 to 13.6 percent in 2011 (an 11 percent decrease in volume). OR procedures involving the female and male genital organs each constituted over 8 percent of all OR procedures in 2011, and both decreased in volume from 2001 (33 percent for female genital organs and 10 percent for male genital organs). Obstetrical procedures also represented just over 8 percent of all OR procedures in 2011—a 23 percent increase in volume since 2001. Figure 1 presents the trend in two orthopedic OR procedures from 2001 through 2011. Knee arthroplasty nearly doubled (93 percent increase) over the 11-year period, from 371,600 procedures in 2001 to 718,500 procedures in 2011. Hip replacement procedures increased by 40 percent over the 10-year period, from 332,500 procedures in 2001 to 466,500 procedures in 2011. Note: Percentage differences presented in the figure refer to changes in procedure volume between 2001 and 2011. Figure 1. Orthopedic operating room procedures, 2001—2011. This figure is a line chart showing the number of procedures by year for two procedures. Arthroplasty of the knee (93% increase in procedure volume from 2001 to 2011): 2001: 372,000, 2002: 407,000, 2003: 434,000, 2004: 488,000, 2005: 556,000, 2006: 553,000, 2007: 611,000, 2008: 687,000, 2009: 686,000, 2010: 730,000, 2011: 718,000. Hip replacement, total and partial (40% increase in procedure volume from 2001 to 2011): 2001: 332,000, 2002: 346,000, 2003: 343,000, 2004: 368,000, 2005: 383,000, 2006: 370,000,2007: 404,000, 2008: 439,000, 2009: 438,000, 2010: 456,000, 2011: 467,000. Source: Agency for Healthcare Research and Quality (AHRQ), Center for Delivery, Organization, and Markets, Healthcare Cost and Utilization Project (HCUP), Nationwide Inpatient Sample (NIS), 2001—2011. Back-related OR procedures are shown in Figure 2. Spinal fusion increased by 70 percent, from 287,600 procedures in 2001 to 488,300 procedures in 2011. Laminectomy remained relatively stable during the same time period at about 490,000 procedures each year. Figure 2. Back-related operating room procedures, 2001-2011. This figure is a line chart showing the number of procedures by year for two operating room procedures. Laminectomy: 2001: 485,000, 2002: 476,000, 2003: 325,000, 2004: 324,000, 2005: 349,000, 2006: 360,000, 2007: 368,000, 2008: 426,000, 2009: 447,000, 2010: 492,000, 2011: 488,000. Spinal fusion (70% increase in procedure volume from 2001 to 2011): 2001: 288,000, 2002: 306,000, 2003: 325,000, 2004: 324,000, 2005: 349,000, 2006: 360,000, 2007: 368,000, 2008: 426,000, 2009: 447,000, 2010: 492,000, 2011: 488,000. Source: Agency for Healthcare Research and Quality (AHRQ), Center for Delivery, Organization, and Markets, Healthcare Cost and Utilization Project (HCUP), Nationwide Inpatient Sample (NIS), 2001—2011. 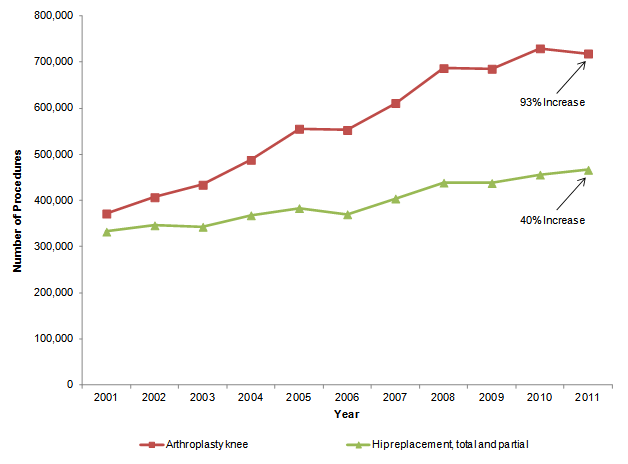 As shown in Figure 3, the volume of appendectomy procedures decreased by 13 percent over the 11-year period, from 376,700 procedures in 2001 to 327,100 procedures in 2011. Colorectal resection procedures and cholecystectomy/common duct exploration procedures remained relatively stable during this time: colorectal resection (about 320,000 procedures per year) and cholecystectomy (about 460,000 procedures per year). Figure 3. Digestive-related operating room procedures, 2001-2011. This figure is a line chart showing the number of procedures by year for three operating room procedures. Colorectal resection: 2001: 307,000, 2002: 319,000, 2003: 315,000, 2004: 316,000, 2005: 320,000, 2006: 320,000, 2007: 329,000, 2008: 341,000, 2009: 326,000, 2010: 318,000, 2011: 333,000. Appendectomy (13% decrease in procedure volume from 2001 to 2011): 2001: 377,000, 2002: 386,000, 2003: 386,000, 2004: 384,000, 2005: 391,000, 2006: 382,000, 2007: 377,000, 2008: 379,000, 2009: 370,000, 2010: 352,000, 2011: 327,000.Cholecystectomy and common duct exploration: 2001: 466,000, 2002: 477,000, 2003: 467,000, 2004: 456,000, 2005: 446,000, 2006: 448,000, 2007: 434,000, 2008: 465,000, 2009: 460,000, 2010: 450,000, 2011: 449,000. Source: Agency for Healthcare Research and Quality (AHRQ), Center for Delivery, Organization, and Markets, Healthcare Cost and Utilization Project (HCUP), Nationwide Inpatient Sample (NIS), 2001—2011. 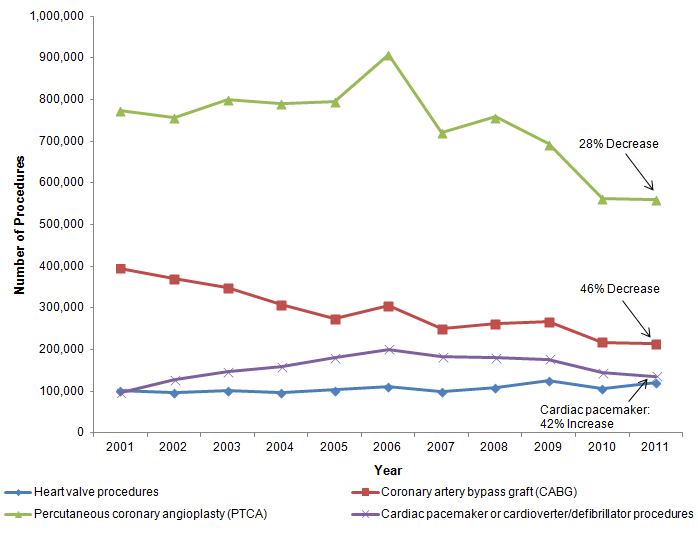 Figure 4 shows that the number of coronary artery bypass graft (CABG) procedures decreased by 46 percent, from 395,100 procedures in 2001 to 213,700 procedures in 2011. Similarly, percutaneous coronary angioplasty (PTCA) decreased by 28 percent, from 773,900 procedures in 2001 to 560,500 procedures in 2011; the decrease occurred primarily between 2006 and 2011. The volume of cardiac pacemaker or cardioverter/defibrillator procedures increased by 42 percent during this time, from 96,000 procedures in 2001 to 135,800 procedures in 2011. Heart valve procedures remained relatively stable during the 11-year time period at about 110,000 procedures each year. Figure 4. Heart-related operating room procedures, 2001-2011. This figure is a line chart showing the number of procedures by year for four operating room procedures. Heart valve procedures: 2001: 100,000, 2002: 97,000, 2003: 102,000, 2004: 96,000, 2005: 103,000, 2006: 110,000, 2007: 98,000, 2008: 108,000, 2009: 124,000, 2010: 107,000, 2011: 120,000. Coronary artery bypass graft (46% decrease in procedure volume from 2001 to 2011): 2001: 395,000, 2002: 370,000, 2003: 348,000, 2004: 308,000, 2005: 275,000, 2006: 305,000, 2007: 251,000, 2008: 262,000, 2009: 268,000, 2010: 218,000, 2011: 214,000. Percutaneous coronary angioplasty (PTCA) (28% decrease in procedure volume from 2001 to 2011): 2001: 774,000, 2002: 757,000, 2003: 800,000, 2004: 791,000, 2005: 795,000, 2006: 907,000, 2007: 722,000, 2008: 758,000, 2009: 693,000, 2010: 562,000, 2011: 560,000.Cardiac pacemaker or cardioverter/defibrillator procedures (42% increase in procedure volume from 2001 to 2011): 2001: 96,000, 2002: 127,000, 2003: 146,000, 2004: 159,000, 2005: 179,000, 2006: 201,000, 2007: 182,000, 2008: 179,000, 2009: 177,000, 2010: 143,000, 2011: 136,000. Source: Agency for Healthcare Research and Quality (AHRQ), Center for Delivery, Organization, and Markets, Healthcare Cost and Utilization Project (HCUP), Nationwide Inpatient Sample (NIS), 2001—2011. Figure 5 shows a decrease in two specific vascular OR procedures that are not related to the heart. Both endarterectomy and peripheral vascular bypass decreased by approximately one-third between 2001 and 2011. Endarterectomy decreased from 151,000 procedures in 2001 to 102,700 procedures in 2011. Peripheral vascular bypass decreased from 121,000 procedures in 2001 to 76,200 procedures in 2011. Figure 5. Other vascular operating room procedures, 2001-2011. This figure is a line chart showing the number of procedures by year for two operating room procedures. 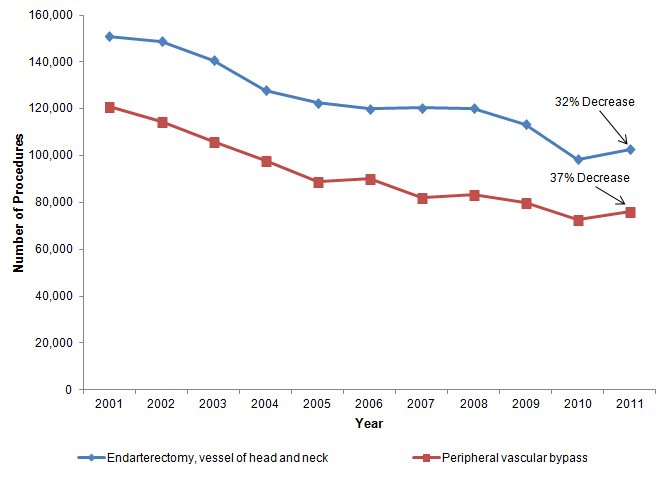 Endarterectomy, vessel of head and neck (32% decrease in procedure volume from 2001 to 2011): 2001: 151,000, 2002: 149,000, 2003: 141,000, 2004: 128,000, 2005: 123,000, 2006: 120,000, 2007: 120,000, 2008: 120,000, 2009: 113,000, 2010: 98,000, 2011: 103,000. Peripheral vascular bypass (37% decrease in procedure volume from 2001 to 2011): 2001: 121,000, 2002: 114,000, 2003: 106,000, 2004: 98,000, 2005: 89,000, 2006: 90,000, 2007: 82,000, 2008: 83,000, 2009: 80,000, 2010: 73,000, 2011: 76,000. Source: Agency for Healthcare Research and Quality (AHRQ), Center for Delivery, Organization, and Markets, Healthcare Cost and Utilization Project (HCUP), Nationwide Inpatient Sample (NIS), 2001—2011. 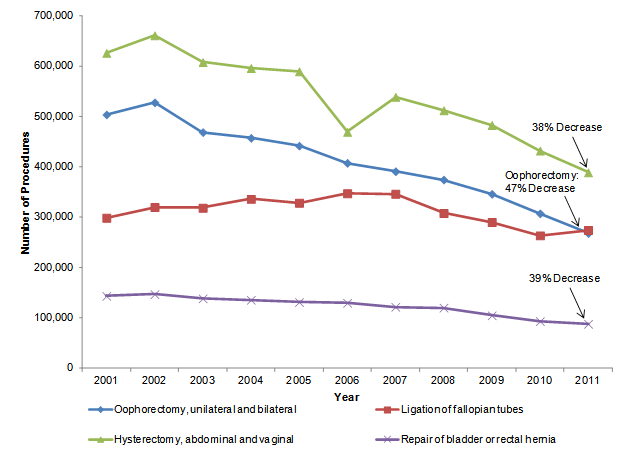 Figure 6 shows that the volume of hysterectomy, oophorectomy, and repair of bladder or rectal hernia procedures each decreased by about 40 percent between 2001 and 2011. Hysterectomy decreased from 626,600 procedures in 2001 to 389,100 procedures in 2011. Oophorectomy decreased from 504,100 procedures in 2001 to 268,200 procedures in 2011. Repair of bladder or rectal hernia procedures decreased from 143,400 procedures in 2001 to 87,800 procedures in 2011. In contrast, ligation of the fallopian tubes remained relatively stable during the 11-year time period at about 310,000 procedures each year. Figure 6. Operating room procedures related to female genital organs, 2001-2011. This figure is a line chart showing the number of procedures by year for four operating room procedures. Oophorectomy, unilateral and bilateral (47% decrease in procedure volume from 2001 to 2011): 2001: 504,000, 2002: 528,000, 2003: 469,000, 2004: 458,000, 2005: 442,000, 2006: 408,000, 2007: 391,000, 2008: 375,000, 2009: 346,000, 2010: 307,000, 2011: 268,000. Ligation of fallopian tubes: 2001: 299,000, 2002: 320,000, 2003: 319,000, 2004: 336,000, 2005: 329,000, 2006: 347,000, 2007: 346,000, 2008: 308,000, 2009: 290,000, 2010: 432,000, 2011: 274,000. Hysterectomy, abdominal and vaginal (38% decrease in procedure volume from 2001 to 2011): 2001: 627,000, 2002: 662,000, 2003: 608,000, 2004: 596,000, 2005: 590,000, 2006: 469,000, 2007: 539,000, 2008: 512,000 ,2009: 483,000, 2010: 432,000, 2011: 389,000. Repair of bladder or rectal hernia (39% decrease in procedure volume from 2001 to 2011): 2001: 143,000, 2002: 147,000, 2003: 138,000, 2004: 136,000, 2005: 131,000, 2006: 130,000, 2007: 122,000, 2008: 120,000, 2009: 105,000, 2010: 93,000, 2011: 88,000. Source: Agency for Healthcare Research and Quality (AHRQ), Center for Delivery, Organization, and Markets, Healthcare Cost and Utilization Project (HCUP), Nationwide Inpatient Sample (NIS), 2001—2011. Figure 7. Delivery and newborn operating room procedures, 2001-2011. This figure is a line chart showing the number of procedures by year for two operating room procedures. Circumcision: 2001: 1,182,000, 2002: 1,247,000, 2003: 1,189,000, 2004: 1,205,000, 2005: 1,229,000, 2006: 1,218,000, 2007: 1,297,000, 2008: 1,225,000, 2009: 1,167,000, 2010: 1,144,000, 2011: 1,101,000. Cesarean section (28% increase in procedure volume from 2001 to 2011): 2001: 996,000, 2002: 1,104,000, 2003: 1,171,000, 2004: 1,271,000, 2005: 1,304,000, 2006: 1,346,000, 2007: 1,482,000, 2008: 1,378,000, 2009: 1,382,000, 2010: 1,278,000, 2011: 1,272,000. Source: Agency for Healthcare Research and Quality (AHRQ), Center for Delivery, Organization, and Markets, Healthcare Cost and Utilization Project (HCUP), Nationwide Inpatient Sample (NIS), 2001—2011. The estimates in this Statistical Brief are based upon data from the Healthcare Cost and Utilization Project (HCUP) 2001 through 2011 Nationwide Inpatient Sample (NIS). Estimates of the volume for selected operating room (OR) procedures were taken from HCUPnet, the online query system that provides free access to information from HCUP: http://hcupnet.ahrq.gov/. HCUPnet provides the ability to retrieve health statistics and information on hospital inpatient and emergency department utilization. For the purposes of this Statistical Brief, the number of OR procedures is reported to the nearest hundred. All-listed procedures include all procedures performed during the hospital stay, whether for definitive treatment or for diagnostic or exploratory purposes. ICD-9-CM is the International Classification of Diseases, Ninth Revision, Clinical Modification, which assigns numeric codes to procedures. There are about 4,000 ICD-9-CM procedure codes. CCS categorizes procedure codes into clinically meaningful categories.8 This "clinical grouper" makes it easier to quickly understand patterns of procedure use. CCS categories identified as "Other" typically are not reported; these categories include miscellaneous, otherwise unclassifiable procedures that may be difficult to interpret as a group. Table 2 lists the specific CCS procedure categories and clinical body systems for the selected OR procedures presented in the trend figures in this Statistical Brief. Introduction to the HCUP Nationwide Inpatient Sample, 2009. Online. May 2011. U.S. Agency for Healthcare Research and Quality. http://hcup-us.ahrq.gov/db/nation/nis/NIS_2009_INTRODUCTION.pdf. Accessed December 4, 2013. Houchens R, Elixhauser A. Final Report on Calculating Nationwide Inpatient Sample (NIS) Variances, 2001. HCUP Methods Series Report #2003-2. Online. June 2005 (revised June 6, 2005). U.S. Agency for Healthcare Research and Quality. http://www.hcup-us.ahrq.gov/reports/methods/2003_02.pdf. Accessed December 4, 2013. Weiss AJ (Truven Health Analytics), Elixhauser A (AHRQ). Trends in Operating Room Procedures in U.S. Hospitals, 2001—2011. HCUP Statistical Brief #171. March 2014. Agency for Healthcare Research and Quality, Rockville, MD. http://www.hcup-us.ahrq.gov/reports/statbriefs/sb171-Operating-Room-Procedure-Trends.pdf. The authors would like to acknowledge the contributions of Minya Sheng of Truven Health Analytics and Ed Hock of Social & Scientific Systems, Inc.
1 Pfuntner A, Wier LM, Stocks C. Most Frequent Procedures Performed in U.S. Hospitals, 2011. HCUP Statistical Brief #165. October 2013. Agency for Healthcare Research and Quality. Rockville, MD. 2 Elixhauser A, Andrews RM. Profile of inpatient operating room procedures in US hospitals in 2007. Arch Surg. December 2010;145(12):1201—8. 4 HCUP Procedure Classes. Healthcare Cost and Utilization Project (HCUP). U.S. Agency for Healthcare Research and Quality. Rockville, MD. Updated September 2013. http://www.hcup-us.ahrq.gov/toolssoftware/procedure/procedure.jsp. Accessed December 4, 2013. 5 Elixhauser and Andrews 2010. 6 Procedures are identified using AHRQ's Clinical Classifications Software (CCS). Certain CCS procedure categories with at least 100,000 annual discharges are not reported: procedures that are identified as â€œotherâ€�; procedures that are nonspecific and could be performed for a variety of reasons (e.g., treatment, fracture, or dislocation of lower extremity other than hip or femur; small bowel resection; amputation of lower extremity; partial excision of the bone); and procedures that are likely to be adjuncts to other procedures (e.g., excision, lysis peritoneal adhesions; treatment, fracture, or dislocation of hip and femur). 7 Non-neonatal circumcisions represent fewer than 1 percent of all OR circumcision procedures and were excluded from Figure 7. 8 HCUP Clinical Classifications Software (CCS). Healthcare Cost and Utilization Project (HCUP). U.S. Agency for Healthcare Research and Quality, Rockville, MD. Updated March 2013. http://www.hcup-us.ahrq.gov/toolssoftware/ccs/ccs.jsp. Accessed December 4, 2013. 9 HCUP Procedure Classes. Healthcare Cost and Utilization Project (HCUP). U.S. Agency for Healthcare Research and Quality. Rockville, MD. Updated August 30, 2012. http://www.hcup-us.ahrq.gov/toolssoftware/procedure/procedure.jsp. Accessed December 4, 2013. Internet Citation: Statistical Brief #171. Healthcare Cost and Utilization Project (HCUP). January 2014. Agency for Healthcare Research and Quality, Rockville, MD. www.hcup-us.ahrq.gov/reports/statbriefs/sb171-Operating-Room-Procedure-Trends.jsp.